As a new school year begins, we know we’ll be thinking about ways we can help children develop a sense of community, getting to know each other well, sharing experiences and ideas, making connections. There are always systems we can use from year to year to help this process along. For example, we know that if children have photo albums in the classroom with photos of themselves and their families, they’ll use those albums first for personal comfort and to have a sense of their family’s presence in the classroom, then begin to talk about the photos and share with teachers and classmates. Soon children will approach each other, even without a teacher, for these conversations, and to set up spontaneous meetings so that they can share common experiences and talk about home. 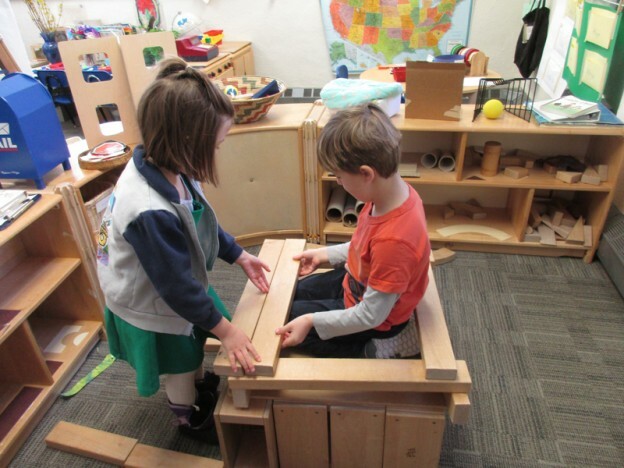 Sometimes children find their own way to build community, and think about why and how they might form relationships. In this year’s youngest group, it was conversations about shoes that got this process started. It is by listening to these quiet conversations that teachers can often find important themes to incorporate into child-driven projects. Happily, in the case described above, the physically smaller child was pleased to be noticed and accepted the friendly tone of the bigger child, so that when a teacher joined to clarify that people of all ages are all different sizes, that you could be bigger or smaller when you were older and that our classroom had school children but no babies, play and friendly conversations moved on easily. But it did become clear that whether or not we teachers brought it up, children were looking at each other and making comparisons as one of their strategies to get to know each other. We decided to offer a project about shoe sizes, since many children were interested in the sizes of shoes and feet. We started by taking photos of everyone’s shoes, since children thought this would be helpful. We did find we could identify which shoes belonged to each child in the photo, but looking at the photos didn’t really help us know much about the relative sizes of shoes and feet. On another day, we offered unifix (small blocks, all the same size, that connect) as a way to compare shoe and foot size. If we knew that some shoes were longer and needed more blocks to be the same size, those must be the bigger shoes! At meeting, everyone who wanted to have a turn estimated how many unifix would be needed for their shoes, and we discovered that most had shoes 9 unifix long, some had longer shoes (10 unifix), and some had shorter shoes (8 unifix). 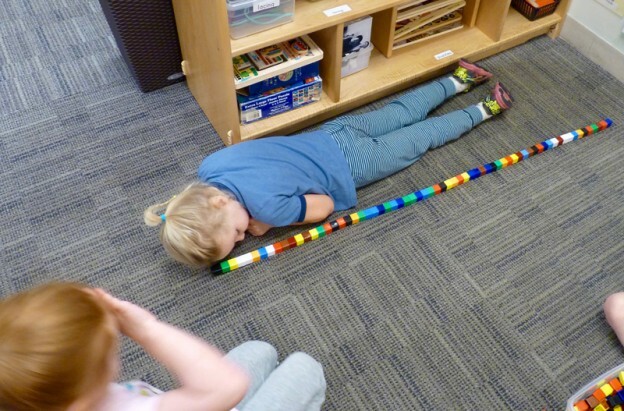 Many children continued to measure various parts of their bodies (primarily arms and legs) and some measured their whole length. 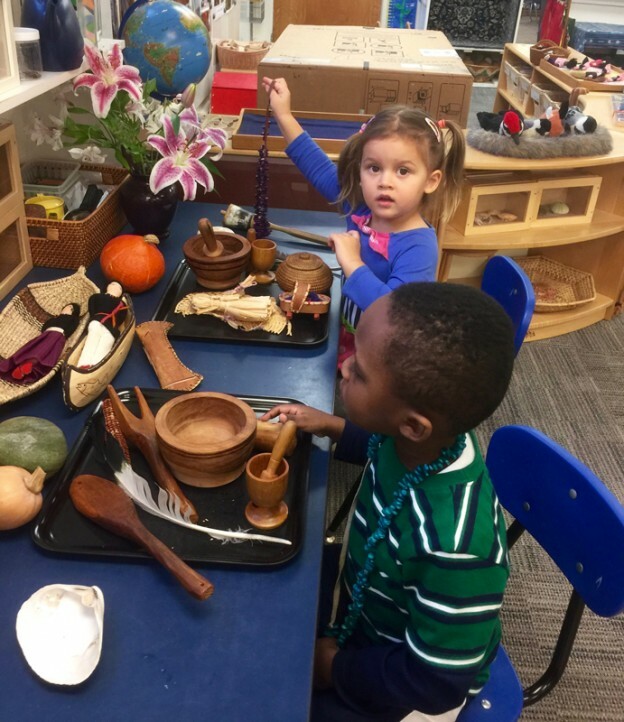 The process of measuring brought children with similar interests together, and we found that there was an interest in finding ways to share materials and ideas for the sake of this beginning collaboration. We haven’t pushed further on these activities, but are listening carefully as we find many children continue think about how big they are now that they come to school. One child made a row of unifix and said, “This is how big I was when I was a baby; I’m bigger now.” Others have begun to share the many things they can do for themselves now that they are bigger, and we often talk about how small the children were as babies as a point of comparison to their size and skills now that they are school children. We’ll keep this interest in measurement in mind as we continue to offer children opportunities to find common experiences that can form the foundations of their relationships and community building. This entry was posted in Curriculum, Education, Project and tagged children, curriculum, education, learning, preschool, social studies on September 25, 2017 by Katrina Selawsky. This year many of our youngest children (primarily 3 year olds) showed strong interests in math, and an opportunity to collaborate on a big mathematical problem came up on our last day of school. We have been using a rolling calendar all year, marking the number of days we’ve shared at school, and watching the roll of paper get bigger and bigger. Our plan was to unroll the paper on the last day so that we could see how long our school year was. We also planned to cut the paper up afterwards, so that each child could take a part of their school year home. Someone pointed out that we could figure it out if we had something to count. A teacher thought out loud about what we had 163 of in the classroom and remembered that we have many periwinkles, and the children thought we should count out 163 of them. When the teacher pointed out that this would be a very big job, and asked if they really wanted to do all that counting, many children enthusiastically said yes. At this point, the children needed a bit of guidance, so a teacher suggested that we could count the 163 shells and then make a pile of shells for each child from those 163. Then, if we counted each pile, we’d know how many days could travel home with each child. Again, teachers asked children to think about how big the job would be. We’d have to find a big enough space for 15 piles, and make sure no one combined piles, or moved them until we had counted out all the shells. About half the group decided they would get the job done. It took a long time, but we did manage to count out the shells and create 15 piles. And children discovered that some would take home 11 numbers, and some only 10, but that was ok because we only had 163 days. Before cutting our days, we worked together to unroll the calendar to see how long it was. Too long for the hallway! By this time everyone was working together, since it took all 15 children to hold “our year” in place. The level of interest and enthusiasm for taking on this counting challenge was quite impressive, as was the children’s capacity to stay on task for the extended time it took for all this counting to happen. Although the children weren’t ready to figure out on their own how to divide 163 into parts, once that suggestion was made, they helped each other stay on track, count accurately, make sure there was a pile for everyone, check their work, and then call on others to help manage the long length of paper representing our year. 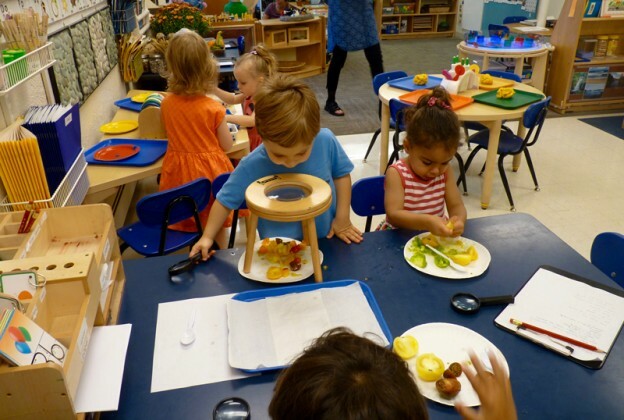 Every child was involved in the project – each at his or her own level, each with his or her own approach, some counting by tens, some by ones, listening to and learning from each other. Contrast the learning that comes out of an experience like this to the learning that comes out of drill or worksheets. This entry was posted in Curriculum, Education and tagged curriculum, education, learning, math, preschool on June 18, 2017 by Katrina Selawsky.